The Best Photo Tip I Ever Received… What Was Yours? 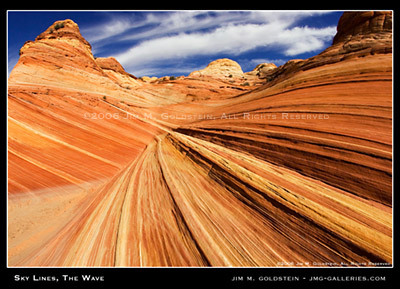 The following post on The Best Photo Tip I Ever Received is by San Francisco based photographer Jim M. Goldstein. Learn more about him at the end of this post. What does that mean and why is it so significant? It means display something in the foreground of your photo that is in sharp focus and the other elements in the mid or background will lend itself well to the scene as a whole whether in soft or sharp focus. By default the human brain strives to find something to focus on and make sense of… a means to put order to the chaos of our surroundings if you will. You can think of this focal point as an anchor. Having an anchor of focus to the scene you photograph is extremely important. In fact I bet most of you don’t even realize you’re looking for a visual anchor when viewing an image. This behavior is an unconscious one, but a very important behavior to exploit in ones photography. Once you recognize and harness this human behavior you begin to look at photography a little differently. As you line up subjects to photograph you begin to think in terms of what element of your image will be the subject, how to capture it sharply, and how much of the surroundings should then be in focus to accentuate your subject. This later point is a key component to the subject of my next post on understanding depth of field. Until then… What has been the best photo tip you’ve received to date? This post was written by Jim M. Goldstein. Jim’s landscape, nature, travel and photojournalism photography is featured on his web site JMG-Galleries.com, and blog. In addition Jim’s podcast “EXIF and Beyond” features photographer interviews and chronicles the creation of some of his images. That your first 10,000 images are your worst. Always bring your camera with you. How can you create a photograph without the camera? Another one from A Adams: Visualize the final product. How do you want the scene to look on paper (on the web)? Then adjust the camera, lighting, post processing however you need to achieve that result. In other words, think before you press the shutter. The first on that comes to mind it that the "Rule of Thirds" is an oversimplification of the Golden Ratio. And the Golden Ratio involves Golden Spirals, Golden Arcs, Golden Angles, Golden Rectangles, and several others. That understanding opened up a whole lot of other possibilities in composition using the principle. The Rule of Thirds is just a good start; continue beyond it. The other advice that I am working on was given by an artist friend that said to me, " Be more intuitive when shooting and less structured." The best advice I have been given was not a general advice per se, but an introduction to using the histogram to judge exposure instead of chimping. The best tip i ever got was: Photograph the light... and i think i read it here on DPS! Best advice I ever got was "slow down!" The best tip i ever got was from an article here, don't remember which one. Someone claimed he spent more time considering the background than the foreground objects. I have changed my way of shooting after reading that article, and improved my pictures a lot. 1. Know your point of interest. 2. Don't keep your camera in the bag. Take it out and shoot, shoot, shoot. Keep on shooting and experimenting. Read up or find out about stuff you're not sure of. Stop listening to people telling you how to take photographs.. Go out and learn for yourself..
Love it, that's my favorite technique to use, it really works. The pics always come out amazing. I've interpreted that to impact several areas: 1. aim your viewer's eye to a specific subject, 2. keep the photo simple, 3. remove anything from the frame that detracts from 1 and 2. Being a creative person in different mediums, I am always my worst critic. I don't know who said it and it may have been on this site but this quote has helped me be more confident in my own photography skills. "The difference between a good photographer and a great photographer is that a great photographer doesn't tell you how many shots it took to get that one great picture." For sports photographers..."If you saw the play, you missed the shot." Best tip i remember was to put a battery in the camera. "You don't take a photograph, you make it".
" take as many pictures as you can, no matter how awkward the angle or lighting, you never know what picute may be perfect." “Remove the lens cap”... LOL!!! "Shoot black and white for a few years, before you move to color." using aperture mode to take portraits. made a noticeable difference to the quality of my pics. Shoot with the fastest glass you can afford wide open to get the best out of focus backgrounds. The best tip is to understand exposing for the shadows and developing for the highlights. When it comes to digital just understand what a grey card can do. Realize that what you see in your mind will not necessarily show up in the picture. There are a dizzying number of reasons for this (camera settings, focal length, 3D vs 2D, ...) Systematically work through those issues to deliver the most effective picture. If it feels good, shoot it!! "the question is not what u look at but what u see"
If using artificial light, use it off camera! I use when the composition isn't right or if I want to change the color of something in the photograph. The best tip I would say is "pay attention to the light"
use it every time i take a photograph. ps: "photoshop is not cheating"
1) If you saw it you missed it. Always be ready to shoot. 2) Print you photos more. It forces you to go through your shots and apply a critical eye to them. There is something magical when you have your photos in your hand. It makes them come alive. Hey Jim, hey Darren ! "Take thousands and thousands of shots, than you will get better"Never has brought me a tip so far than this one. I received it in an email from a professional photographer which I had asked to answer my question of how to get a better photographer. never under estimate your clients. "Your photo will be no better than the quality of the light... if the light is mediocre, do not expect anything more than a mediocre photo"
"You can't take a great photo if you leave your camera at home"
Always focus on the eyes, whether this be a person, an animal or even a statue. The rest of the photo may be softly blurred, but if the eye is in focus it will look artistic overall. Train your "photography mode" thinking - once you get used to your camera and lens(es), you will memorize the way you see through the viewfinder and then look at the world around you like you would see it through the viewfinder. See the pictures around, ready for you to take them. This way, you save time and will be always prepared to shoot. Think photography! For me photgraphy is 80% composition so I always "FILL THE FRAME". Shoot in RAW... shoot in RAW! 1) You are photographing the light. 2) Fill flash for portrait shots on sunny days. paint the photograph with lights. "Fill the frame, as space is always exaggerated in a photograph"
-Leave some air ubove people heads. "A camera ain't nothin' but a box that lets the light in"
The best advice that I ever have gotten was from Vincent Versace at one of his seminars. I live by that and it is a good bit of advice. 5) Learn to 'read' photographs - light, composition, depth of field etc. Good pictures can be had with average cameras. But to take a really "good" or "great" picture, you need to have a higher end DSLR. Then learn how to use it. It's sort of like listening to digital recordings on a $100 stereo system. I had a 4megapixel Kodak and took good photos. I made the switch to a DLSR and have never looked back. As a previous poster Bilka said, buy the best camera yo can afford. When shooting portaits in bright sunlight use a flash to reduce facial shadows. When doing weddings, scout the area and take test shots a day or so earlier. Install fresh batteries or recharged batteries the day of the wedding and keep a few spares close by. Use two or more memory cards incase one fails so all is not lost. Have a second photographer if posible. Have a check of list of the type of "must have" photos that the wedding party requires. You'll only get one chance so preparation is the key. Whilst I don't believe that "photoshop is cheating", I do believe that photoshop isn't photography. To me photography is the art of capturing an image, and for me getting the best image with the camera is most important. I much prefer to be outside shooting photos and experimenting with exposure, focus and composition than sat in front of a computer tweaking a picture until there is nothing left of the original. Changing white balance, brightness and sharpening are all necessary parts of Digital photography but if you don't have a good picture to begin with then its all a waste of time. stop and take a look behind you after you have shot the story in front of you...there are many times interesting stories going on right behind you. Difuse a harsh flash quickly with a white plastic bag. Simply cover the flash (be careful not to cover the lens! )and shoot!! My best photo tip was rule of thirds. I found I could take two photos with identical attributes, but when I positioned the subject with the rule of thirds, the photos always look 10 times better. If you're shooting outside, shoot w/ the light coming over either shoulder (I.E. sun behind you and at an angle) if at all possible. Works almost every time. To add to one that was above, if you're taking pictures inside or of kids you need a 50mm lens. Not only will it help you learn not to stand still (no zoom) the 1.8/1.4 will let you shoot without flash most of the time. Your pictures will be immeasurably better for the cost of a 100$ lens that you will have forever. Get one. Period. Rule of thirds for me, especially in landscape shots. "Light is EVERYTHING in photography"
Without light there is no photo. But the best advice was how to REALLY learn about that. When I was novice photographer my frind told mo to pick a target (ie. building and some trees) and photograph same place in Morning sun, Midday sun, evening sun, half cloudi, cludy day, winter, summer and then look how diffirent picture was from diffirent angles and diffirently scatterd light. Second "lesson" was to photograph a person in bright daylight from every angle so that person would allways look directly in camera. Every photo with and without direct fillflash from camera. That way you have pictures of person with every possible angle of sunlight. These two practise lessons really showd me ten years ago how light works in photography. They both took roll of film and have saved me MANY MANY rolls of film after plus learning rally easy how light works and how significant it is. "Before taking a single photo, go and pick up 'Understanding Exposure' and read it." There's nothing like a nice piece of glass! From SLR film days: "Spend time with a 50mm lens." The idea is that you will best learn composition by forcing yourself to shoot only with a 50mm. Best Tip i got was "Know your gear"
Actually, I think I made this one up, but more probably this is what someone said to me. Not only does it mean to make sure that you have what is needed to ensure success, but also to take exceptional care with each shot to ensure it is captured properly. If it's worth taking one photo of, it's worth taking a whole roll of. What's it mean? Take more pictures, basically, but of the same subject. 24 or 36 shots gave an opportunity to experiment with perspective, light, focus, and exposure. I created a lot of interesting work that way, and it's definitely helped me to understand the technical side of things better than ever, as well as greatly improved my eye for what's interesting. Don't be ambiguous with your composition. Either include something in the frame or crop it out. Don't leave something floating precariously close to the edge of frame - not quite in the photo and not quite cut off by the edge of frame. Always be decisive with your edges. First answer the question...Why am I taking this photograph. "Do you REALLY want a photo of this?" I got the advice first day of my first photography class, and it's served as a basis for every picture I've taken since. If I can answer 'Yes..I DO want a photo of this.' then I can decide if I should move in, or out...or how to compose it...a lot of times, I'll be shocked, that I answer...'no...I don't really want a picture of this.' and I move on. "Take notes on every shot - you will learn far more from your failures." In film, that grew cumbersome. In Digital, EXIF data covers most of the info you need. But don't be afraid to take other notes (time of day, etc). "Find a favorite shooting location and return often. Not only will you catch subtle changes over time, but you have a basis for comparison as you grow." As anyone that's familiar with my work will notice, I spend a lot of time shooting around Lake Naomi near Mount Pocono, Pennsylvania. I think the best tip I ever got was that LIGHT is the key. Every time I shoot a scene I try to examine available light. Then I think about how shooting that same scene at different times of the day could improve the shot. Even though I've always known about the "magic hours" (1 hour after sunrise and 1 hour before sunset), I now try to be more active about shooting during these times of the day...what a difference! In digital photography, film is cheap. I'm far from a novice, is there something that comes before novice? Anyway, I seem to take some decent shots keeping the "rule of thirds" in the back of my mind and always taking several as opposed to one. Almost always do I find the subsequent photos are better than the one I thought was exactly as I wanted it. Don't know where I learned these techniques, probably browsing in a bookstore somewhere, but they have made my photography better. Photography is not about pressing the button. It starts in your head - its what i want to say. - If you wan't to take good pictures stand in front of more interresting things. An what you need... Passion, Vission, Technique, Inspiration and creativity. Somewhere between "Fill the frame", and "It's not the camera". The first was the tip that literally got me interested in understanding how to actually compose a photo, rather than just blindly snap away at random. The second tip I kind of told myself when I first wanted to run out and buy an SLR because I thought it would automatically make me a better photographer. It forced me to not only compose and produce better photos, but it taught me to really fully exploit the technology that I already had. I learned to fully push my point and shoot to the max and while I eventually upgraded to an SLR, I did so only with a full understanding of why. Only show your best work. That being said, 'interesting' is certainly relative!! "Does it look good to you?" "Digital should be no different from film when you press the shutter"
This is one that stuck with me, specifically they were talking about 'wasted shots'. If the answer is no, then change the shot so that it is worth that. Just because digital is 'free', doesn't mean this isn't a good check before you click. The best tip I got was from Bryan Peterson's book, understanding exposure, regarding metering. The Maestero says the easiest way to meter for a land scape or outdoor photo is to meter the blue sky. He calls them the SKY BROTHERS. I tried this and found this a very valuable tip. The whole book is a great read. "A meaningful image tells a story"
I originally come from a photo journalist/journalist background. I learned that whatever you are taking a photograph for, you are telling a story. And like every story it should be one that engages people. Now I do art and commercial stuff, and it's harder if not impossible. However, I try to tell a story in every picture. "Don't tell the whole story in an image, let the viewer figure some of it out." One of the main statement I found out after several years of taking pictures. I didn't hear this from anyone of my friends-photographers. It's rather complex and comprises many artistical and technical moments. But it's essential. Try to express your emotion in photo. Photo is great emotional impact. If you compile an image with rule of thirds, with good light etc., but without emotion - that will fail the image. Express YOUR emotion to outworld. And it can work without rules (but you should know them!). Photo is not only a picture. It's moment of life. Observe and remark. Nature, people etc. If you think great pictures can be captured only in great places of the world you can be dissapointed. They are around us! And they are in ourselfes! You must come to this by yourself. Via your mistakes and experience. Different technical aspects of image taking and editing can be learned. But your attitude, your relation to life is only yours! Not others. The viewfinder is the frame to your world--use it to your advantage and show others what you see. Craft images don't just take pictures. The camera is only a tool. Purchase the best camera you can afford and use it to its fullest but don't ever mislead yourself into thinking that a better camera will make you a better photographer. It won't. Best advice I got from my teacher. Take your camera every where with you. Take pictures off. Try new prespectives. And most of all have fun. I think the fun part was the most important. If you are passionate about what you are taking a picture of, some how that passion translates into the picture. and... pay attention to the background! "Never look at the Sun through a telephoto lens." hurts my feelings every time- but works! The difference between great photographers and a not so great photographers is that the great ones don't show their crappy pictures. This made me realize that even the pros shoot bad pics and don't be discouraged. Just shoot tons of pictures, get rid of the bad ones and learn from your successes and failures. Exposure, exposure, exposure... Did I mention exposure? Visualize what you want the image to look like and then use your exposure to get that look (adjust aperture, shutter speed and ISO for desired affect). Now, this is assuming you know composition already. 4) experiment, its bitmap, its free! Photography is all about capturing light in the right amount in the right way. Take the lense cap off. All my pictures were much too dark, then someone told me "Take the lense cap off, stupid". Following that advice has made a huge difference in my results. Get down to children's level. First, "you can't be a photographer without a camera". I have a 450D (yup, got it last week, upgraded my 300D), but lenses can be a hassle to carry, so I always carry my Digital Ixus for grabbing moments when I'm not "really" shooting. Second, "Shoot often and shoot many." Especially in the age of digital, don't shoot one, shoot five pictures, 10 pictures, try different settings. The more experience you have, the more you'll learn and the better a photographer you'll become. It's not camera. Not the lens, filter or sensor. It's all in your hands and eyes. The best tip I ever read: Bring your camera with you. Without that, you can forget about making any kind of photograph. Though this one isn't so critical anymore, but "Check your ISO!" always rings in my head AFTER I've left the shoot and realized I shot the whole thing on much-too-high ISO setting. White balance and exposure are critical! Shoot in raw to have the most control of both. The example photo above is a huge example of the importance of white balance. On a trip to Death Valley a couple of years back, I shot all the photos in JPEG, and all the shots were completely underexposed and the white balance was off due to the extreme brightness of the sand. I have never been completely satisfied with those photos since. The best tip I ever got came from my father way back when he introduced me and my siblings to photography when we were children - starting us with box cameras and, once we earned the right, letting us use his camera and eventually teaching us to develop film and make prints. His advice - which I generally ignored - was "take three steps closer." Superficially this seems pretty vague, and you can even think of lots of shots in which this might actually be the wrong advice. But in terms of getting one to focus on the main subject - or even to make sure that there is a main subject - it is advice I still think of often when I photograph. Stop reading - go shooting. "Don't take photographs of subjects, take photographs of the light"
Coverage = horizontal, vertical, wide, medium and closeup. The best ever photo tip does change with time as we learn new skills and techniques. What is best one time may be just basic knowledge latter on. The best tip I received very early on in my photography learning journey was when shooting an image examine the 4 corners and make sure they are ok. This is the one thing that I tell everyone just starting out in photography. The compositional rules can come later. Bt this I mean that there is nothing in the corners of the viewfinder that is distracting form the central subject. For most of us it is relatively easily to focus on the main subject and to find an interesting perspective to capture what we find interesting, but we tend to be so focused that we may forget to examine the rest of the scene for objects that donâ€™t fit. Bright highlights, disconnected object sticking in. Things that just donâ€™t add to the image. "Think BEFORE you press the shutter"
Therefore, I'm putting much more effort in my photos now and it works, you know. I'm the webmaster for my karate dojo and spent several weeks getting optimal shots for all of my senseis. What I discovered as a 'best tip' dealt with portraits - have the subject stand with their body at a 45 degree angle to you but have their eyes look directly at you. if you photo is not good, you are probably not close enough! My best tip comes from Ansel Adams, "You don't take a photograph, you make it". * allow my imagination to create a more artistic compos ion. This is by no means to take away from the purist who believes you should never have to make adjustments. However, until they make paper or screens that can produce the same eleven stops of light my eye sees as well as the vibrant colors and contrast that my brain remembers or prefers, but Ansel Adams' quote will always be my guide. Shoot what you want to see. ... That encompases framing, lighting, depth of field. ... Pick your subject, and shoot that the way you want it seen. That's simple. Fill the frame. Best advice I ever got. "Photoshop is cheating", from a friend whos name I don't remember. It's stuck with me, it makes me strive to take 'good' photos, rather than photos that I can 'improve' later on.